Image Size: 28.75" x 16.5"
Paper Size: 32.75" x 21.5"
The infamous 56th Fighter Group, commanded by Cot. "Hub" Zemke and known as Zemke's Wolfpack", could offer a serious challenge to any Luftwaffe fighter who rose to fly against them. The highest scoring USAAF fighter unit of the ETO, they accounted for some 665.5 aircraft destroyed in the air. 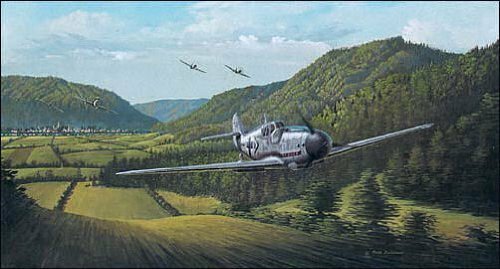 It proved an unfortunate encounter when Major Gunther Rall found himself the focus of four of the 56th's P-47s. As the swirling dogfight descended through clouds toward the valley floor below, Rall found himself with no path of escape from the closing American fighters. Finally within firing range, two bursts of fire from a P-47 hit Rall's aircraft. Injured and with his Me109 damaged, Rall managed to pull into a half loop and bail out.